Every time he decided to make a puppet, Gepetto would first go to the forest to cut wood and clean a log. One day, when he was in the forest looking for the perfect tree, lightning struck and hit one of the trees. He approached it to see what had happened, and that was when he saw the log that remained after the lightning. The log had a little heart carved in it, so the old puppeteer took it. "You will make a great doll!" He brought the log home and started working on it, making a lovely, wooden boy. "What should we name you?" he asked himself, while he was observing the wooden boy. "Pinocchio is perfect, I think! Your name will be Pinocchio!" He kissed the puppet and went to bed. Once Gepetto was asleep, a strange light shined upon the puppet, and out of the blue, a beautiful fairy came in. She touched the doll with her magic wand, and all of the sudden, the wooden boy started blinking. "Hello, Pinocchio," said the fairy, "Your father loved you so much, so I wanted to give him a beautiful gift and make you come to life." "But, I am not a real boy? What if he doesn't love me?" The little wooden boy was worried. "Gepetto is one of the kindest men I've ever gotten the chance to meet. He will love you with all of his heart. Believe me," said the beautiful fairy. The fairy continued, warning Pinocchio, "I could make you a real boy, but you would have to behave like a real, good boy. I will be around when you need me, and to make sure that you won't lie, I will make your nose grow whenever you try. Good boys don't lie." "I won't lie. I promise!" Pinocchio smiled. "Another thing you need to know," said the fairy, "is that all boys have a conscience, so that they don't do bad things, so until you get one yourself, I am giving you this cricket to show you your way." "Hello, Pinocchio! My name is Gimini, and I will be your guide." "Hello, Gimini!" Pinocchio was excited. "Now I have to leave, but I will be around when you need me. Just call "The Blue Fairy" and I will come. Goodbye, Pinocchio." "Bye, Blue Fairy!" Pinocchio was waving at her as the fairy disappeared. Pinocchio entered the room where his father was sleeping and decided to lie next to him and fall asleep. When Gepetto woke up the next morning, he was more than surprised, as he knew he had left the puppet on the table. "How did he end up here?" Gepetto was wandering, as he was took the puppet back to where he had left it. Pinocchio opened his eyes and said, "Hi, Papa!" Gepetto was surprised, and even frightened at the moment, but once he realized that he was a part of a great miracle, he embraced Pinocchio, and hugged him. "You are alive! That is amazing! I named you Pinocchio, but if you don't like it, you can change it." "Pinocchio is perfect. Thank you, Papa!" Pinocchio smiled. "Well, since you are alive and moving now, we better get you to school, where all the good boys go." And so Gepetto sent Pinocchio to school, buying him nice clothes and books he needed. Gimini, the cricket, was hiding in Pinocchio's ear, watching over him to make sure he would behave like a proper boy. On his way to school, two crooks, a nasty cat and a cunning fox, saw Pinocchio as he was walking towards his school and jumping happily. "Look at that puppet! He thinks he is a real boy! Let's mess with him!" The cat was wickedly giggling. "No! I bet he has some money on him, let's trick him into giving us his allowance every day on his way to school," the cunning fox replied. The nasty cat and the cunning fox approached Pinocchio, putting their arms around his shoulders. "Hello, little boy! What's your name?" the cunning fox asked. "They think I am a real boy!" Pinocchio thought happily. "My name is Pinocchio, and I am going to school." "Did your father give you some money to bring to school and buy yourself a lunch?" the nasty cat asked. "Well, yes. He gave me enough to buy an apple." "Apples are awfully distasteful! Yuck!" the cat replied. "You know, Pinocchio, we could show you a way to make more money, and have enough to buy all sorts of delightful candies and treats." "Don't listen to them!" the cricket whispered in his ear, "They are a pair of common thieves and crooks!" But Pinocchio didn't listen; he wanted to find out how he could make more money, and instead of going to school as his father had told him, and Gimini had advised, he went with the nasty cat and the cunning fox. They took him to a field where there was only one tree planted in the middle of all sorts of flowers and berry bushes. "You see that tree, Pinocchio?" the cunning fox asked. "If you plant your money by that tree, more coins will grow on the tree and you could later collect them, and as we are the only ones who know about this place, no one will take your coins." The fox and the cat were giggling as Pinocchio was ignoring the voice of the cricket telling him that the crooks were lying, wanting to take his money. Pinocchio started digging into the ground, and once he was done, he buried his coin. He was happy knowing that he would have a lot of coins once he planted enough, so he wouldn't have to go to school. He returned to the same spot the next day, and planted another coin, while the fox and cat were laughing behind his back. Pinocchio came every day, planting one coin each day, and every time he would plant a coin, fox and cat would come and dig it out. Soon, Pinocchio was getting tired of planting the coins and getting nothing in return, as coins just wouldn't grow on the tree. He decided to dig out all of his coins and take them back, but no matter how many holes he dug, he couldn't find a single coin. Once he was all covered in mud and dirt, he realized that the cricket had been right, as he had indeed been fooled by the cat and the fox. "They lied to me! And tricked me, above all, just to take my coins." Pinocchio was crying as he went back home. He went back to his father, and as Gepetto was sick, he asked Pinocchio to go and buy some milk. Pinocchio took the coin his father gave him and went to the milkman to buy some milk. He took the milk, but instead of bringing it to his ill father, he drank it all up. Once he got back home, Gepetto asked him: "Where is the milk, my son?" "I spilled it..." Pinocchio lied, and as he was lying, his nose started growing. "Why is your nose growing?" Gepetto asked. "I don't know..." Pinocchio lied again, watching his nose growing more and more. "You are lying, Pinocchio... Admit it, tell the truth. Real boys don't lie," said Gimini the cricket. Pinocchio started crying. "Forgive me, Papa... I was lying about everything... I drank the milk. I am so sorry..."
"Never mind, my son. I just want you to be good and go to school. I can go without milk, don't worry." Pinocchio felt sorry for his father, so he decided to get back to school, but once more, he was distracted. On his way to school, a colorful carriage passed by with a man hanging outside and shouting. "Amusement park! All the candies you can eat! All the fun you can have!" "Don't even think about it! You should go to school. Remember what happened the last time?" the cricket whispered in Pinocchio's ear. Pinocchio wanted to listen to his conscience, but then his friend from school approached and told him: "Come on, Pinocchio! This camp is made for real boys!" He wanted to become a real boy above all, so he went with his friends, climbing onto the carriage. After several hours of traveling, Pinocchio arrived at an amazing amusement park, where there were lots of boys eating candies, chocolate, and even drinking beer. After they stuffed themselves with candy, they went to a strange show, where donkeys were trained to do various things, and there was so many of them that Pinocchio couldn't even count them. After the show was over, Pinocchio and his friend went to the play room where they were throwing pies at donkeys and clowns, and as he saw his friends drinking beer, he took some, too. "Well, look at you! Look at what you have become! You should be ashamed! What would your father say if he saw you?" cricket was whispering. "Let me go, Gimini!" Pinocchio said, "I am a real boy now!" "Real boys don't drink and stuff themselves with candy! You will become a donkey before you turn into a real boy!" Gimini said, but Pinocchio wouldn't listen, continuing in this bad behavior and indulging in candy. As he was talking to his friend, he noticed that his ears started looking more like donkey ears than human ones, and as he was drinking and laughing, he started turning into a donkey; first his nose, then his hands and legs, until he got a tail. 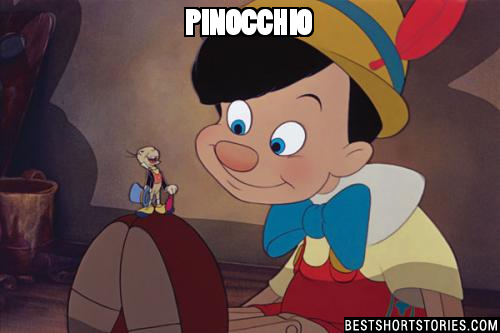 Pinocchio was so frightened that he started calling for his fairy, remembering what she had told him. "Blue Fairy! Blue Fairy! Please come! I will be good, I promise!" The fairy appeared in a mist. "Sorry, Pinocchio, but I cannot help you now. You have strayed from your path." She said those words, almost weeping, and disappeared. Pinocchio didn't know what to do, and as he was holding his head, he felt donkey ears slowly growing. He started panicking, and when he looked in the mirror, he saw that he also had a tail. He tried to get away, feeling sorry for everything he had done, but then came the men who worked at the park, and they took him, along with the rest of the donkeys, to the room filled with other naughty boys who had turned into donkeys. The life of the donkeys in the amusement park was tough and harsh; they were whipped and mistreated, and eventually Pinocchio, who was now a donkey like the rest of his friends, fainted because of all the hard work that he was forced to do. They tied him and threw him in the sea. "This donkey is useless," a man said as he was throwing Pinocchio into the water. As Pinocchio was falling, thinking of how he should have listened to his father, a strange light appeared. The fairy was by him, knowing that he was truly sorry. He opened his eyes, slowly getting back his old, wooden body. He tried to say he was sorry, but the fairy disappeared, and he was swallowed by a massive whale that exact moment. In the meantime, his father looked everywhere for him, sad and alone, wandering the world. He looked for him everywhere, but Pinocchio was nowhere to be found. He stopped making puppets, and was deeply disappointed from losing his son, so he decided to sell all of his equipment and buy a boat. He sailed alone on the sea, living off of the fish. One day, as a big storm came along, his boat was torn into pieces, and Gepetto ended up in the sea. And just like Pinocchio, he was eaten by a whale, which was passing through the great ocean. "Papa?" Gepetto heard a voice as he was slowly waking up. He saw his dear Pinocchio, but he thought he was just a dream, until Pinocchio jumped on him and started hugging his dear father. "Pinocchio! It really is you! I finally found you!" They were so happy that they found each other that they even forgot where they were. "Father, this is all my fault," Pinocchio was crying, "if I had been a good boy, like you had wished for me to be, none of this would have happened!" "Don't cry Pinocchio. At least we are together - and you know now that you were wrong." They were living in the whale's stomach, which wasn't as bad as you would expect it to be, but Gepetto and Pinocchio wished that they could get back home, so Gepetto made a clever plan. As the whale was accidentally swallowing everything that was in his way, Gepetto found lots of wood scraps and boards that had fallen away from wrecked ships and boats. He used sea weed as threads to tie those parts up and put them together, so that they could make a raft. He worked on building the raft for a long time, and after many days, and soon months, the raft was ready. They had only one more problem: they couldn't get out of the whale's mouth, as waves came in every time the whale opened his mouth. Gepetto was very clever, though, so he thought of a way to get himself and Pinocchio out without going through the mouth of the great whale. He told Pinocchio, "Sit on the raft and wait for me." Gepetto went to the whale's teeth and started hitting them with a stick. As the whale was tickled by what seemed to Gepetto like hitting, the whale started to sneeze. Gepetto ran back toward Pinocchio and sat on the raft that he had made. He looked at the hole above them, on the whale's head. The whale sneezed, and they went out through the hole with a spring of water, right into the sea. After so many months spent in the whale's body, they were finally out on the surface. After only a couple of hours spent sailing, they saw land, so they decided to land there. They were rejoicing that they could finally get back home, when a great wave struck them unexpectedly. Gepetto was lying on the beach slowly waking up, but Pinocchio was not there with him. Gepetto lay on the ground and started crying. "Papa?" He heard a voice. He looked up and saw a boy, and he wouldn't have even recognized him if he hadn't heard his voice. "You... You are a real boy!" Pinocchio was as surprised as his father was, but he still rushed into his arms. They got back home, and as he had become a real boy, he promised that he will always be good and go to school, which he did. He earned a real conscious, and Gimini went on his way to help someone else.